SIIGlobal.net Review – 100% Fabricated HYIP Scam! SII Global is a deceptive cryptocurrency site that can most aptly be defined as a cesspool of falsehoods. Every component incorporated into the framework of SIIGlobal.net is fabricated with the deliberate intentions of earning investors trust so that they are more likely to deposit into their vile investment scheme. Embodying a hybrid business model of a MLM and HYIP investment hoax, SII Global is a dangerous multifaceted platform that targets prospective investors from a variety of angles. To learn more about the perilous investment angles pursued by SII Global, make sure to read our concise and in-depth review. Apart from learning about their photoshopped images, we will dig deeper into the petty misconceptions featured inadvisably on their site. According to the site, SII Global was founded by an industrial engineer known as Miguel Ángel Arroyo but is not overseen by any corporate entity. Allegedly created in January 2016, SII Global has been offering robust cloud mining packages, cryptocurrency trading for investors along with an affiliate marketing network geared with fruitful incentives to recruit new investors. Revolving around a 3 phase operational set up, SII Global has offered an all-around platform for potential crypto investors. According to the CEO page found under the About Us tab at SIIGlobal.net, Miguel Ángel Arroyo received a prestigious degree and later went to work as a high level project manager, engineering manager and supply manager in several companies based out of San Luis Potosí. Apart from supposedly operating SII Global, Mr. Arroyo is also the owner of a fictitious company referred to as Commercial Link. Regrettably though, research has failed to confirm that any of these claims are true concerning this entity. Furthermore, Mr. Arroyo is referenced as also being an author of a book titled “Free yourself and Find your Mission.” Yet when you research this book title and author, no relevant search results appear, which we found quite odd. To make matters more grim for SII Global too, when you research “Miguel Ángel Arroyo” in a search engine the only pertinent searches would be those in regards to other SIIGlobal reviews. We also can’t overlook how pathetically photoshopped the image of Mr. Arroyo is, that is featured on the site. How does SII Global Work? Despite SII Global appearing to be a flexible platform that offers numerous investment options, we believe the only active one would be the affiliate network. While the site claims to own 180 mining rigs and equipment worth $630,000, no information regarding these hardware rigs or data centers are disclosed on the site. Allegedly each of their rigs are able to mine up to 6 coins per day, which they then exchange for Bitcoin at a profit. Of course, no transparent evidence is provided regarding this operational aspect. Enrollment through SII Global can be done through 1 of 4 mining packages. Statistically speaking though, only 2 packages listed at SIIGlobal.net are “guaranteed” to be profitable, which of course calls for higher deposits than the first two packages. The package you enroll with will dictate your return potential, which according to the site, is equated to 60% of the exchange profit they accrue from their alleged cryptocurrency mining. SIIGlobal.net is infested with numerous deceitful web elements that could only have been executed by amateur con-artists. Among the first one would be how they claim to have been in operation since January 2016, yet a whois.com report will reveal that this operation was created on September 13th, 2016. Secondly, would be how they claim to be owned and operated by an individual that doesn’t appear to actually exist in the physical world. No trace of Miguel Ángel Arroyo can be found outside results including SII Global. His profile image appears to be poorly photoshopped while no evidence of mining, Bitcoin transactions or terms of conditions are provided on the site. Their Contact Us page refers the visitor to a contact form submission and all the social widgets featured on the site don’t function worth a damn. No physical address or real identifying information is provided either which makes SII Global an anonymous operation. Can SII Global be Trusted? SII Global can be trusted to steal your Bitcoin deposits but nothing more! Consider the facts laid out plainly for you above, every component of this site is fictitious and deceptively engineered to manipulate gullible investors out of their bitcoins. SIIGlobal.net possessed a SimilarWeb global rank of 430,030 as of December 2017. Over 46% of the sites traffic originates from visitors residing within Mexico, while just over 34% of all the site’s traffic derives from referral based sources. 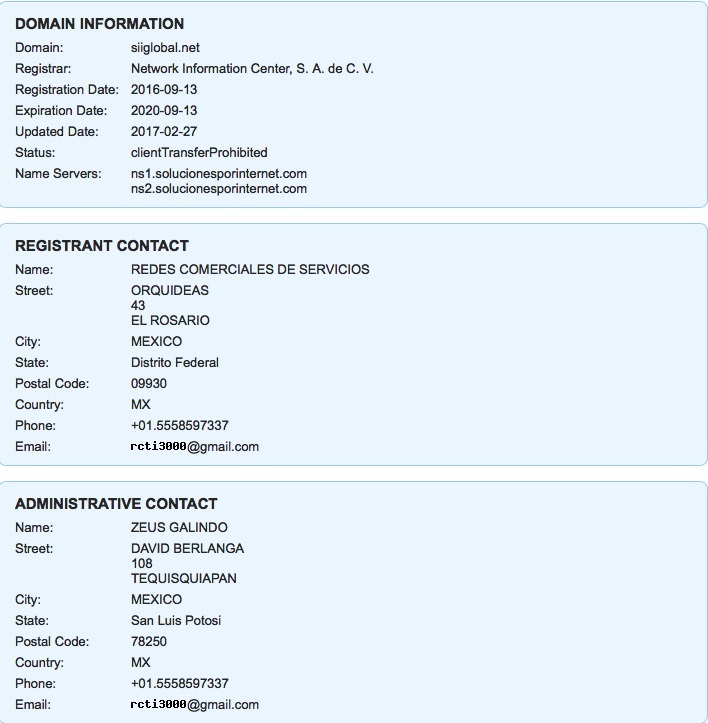 A domain registry search will reveal that an entity known as Zeus Galindo is responsible for the administrative oversight of SII Global, while it appears that SIIGlobal.net was registered under a company known as Redes Comerciales De Servicios. If you are looking to accrue earnings through Bitcoin investing, then our recommendation would be to only invest in fully transparent and verified operations. Make sure you always avoid cryptocurrency doubling schemes or investment services that offer outlandish returns within a short duration of time. If you have a question pertaining to a certain cryptocurrency operation, we implore you to request a review on our Contact Us page before you commit to any site! Review Verdict: SII Global is a SCAM! In need of a dependable and straightforward cryptocurrency investment opportunity? Visit our comprehensive Cryptocurrency Day Trading Center to learn about the best investment alternatives! Please share any feedback, thoughts or experience – positive or negative – by leaving a comment below.